This walnut partners desk once belonged to Kansas Governor George Hodges and his brother Frank. 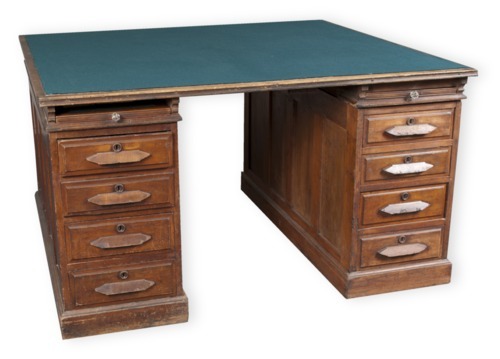 The desk was used at the general office of the Hodges Brothers Lumber Company in Olathe, Kansas. Born in Wisconsin, the Hodges came to Johnson County, Kansas, at an early age. They established a lumber company in 1889 that proved highly successful. Both men were members of the Democratic Party and held political ambitions. George served as the nineteenth Governor of Kansas from 1913 to 1915, and Frank was elected Mayor of Olathe in 1899. The desk appears to have been hand-fashioned from other furniture components, perhaps assembled at the Hodges Lumber Company.